Below you will find some great resources for those looking for some more information. Our favourite paid poker training resources for learning poker quickly can be found here. We have a number of training site reviews with discount codes such as Raise Your Edge, Upswing’s Heads Up Mastery and Upswing’s Poker Lab and Advanced Poker Training. Looking for entertainment and education at the same time? You should definitely check out SplitSuit’s poker quizzes. Challenge yourself and learn something about your game! Regarding forums, TwoPlusTwo poker forum has always been my favourite. Check it out as there is lots of good information and helpful posters. You can find me post under the user gamma001. Play your best poker and learn at the same time by Warming up before session with PokerWarmUp.com. A good warmup will give you a huge advantage over your opponent so check out PokerWarmUp for some awesome routines and habits to get you started. TopPokerValue.com has some excellent poker strategy articles and the most detailed reviews of the new and complicated Poker Stars reward system that you can find. If you’re trying to improve your poker game (as we all should be!) you can go no further than Smart Study Poker Podcast. Sky is a great teacher and his podcast is well worth the listen if your a beginner or experienced player. PokerNerve is an excellent resource for learning how to beat MTT’s. Their MTT Poker Course will teach you how to crush soft tournaments games, even if you are a beginner. They also have free articles such as their PIOSolver GTO which you will find useful. 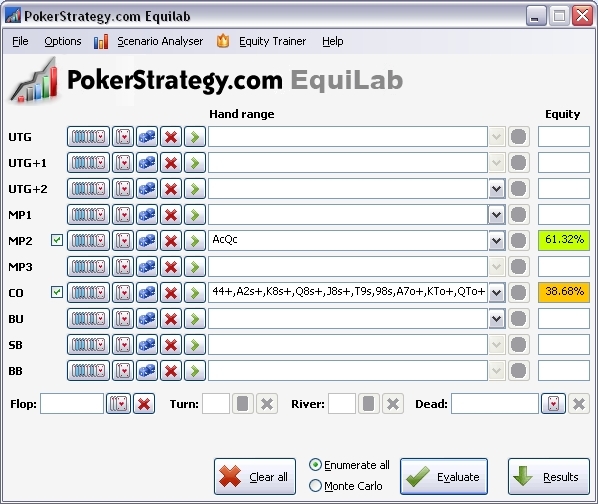 Free poker equity software equilab which allows you to calculate your equity super quickly. This is very helpful for poker players of all skill. Ship-ItPoker.com is another great resource for poker news and US casino reviews. If you’re looking for cool gear to wear at the table, check out Kicker Problem for hats, hoodies and jackets. They also have a good list of recommended poker resources.